It was one of those perfect afternoons, we had family over, good music playing in the background and my mom was busy with a braai. I was still in school at the time and recall asking myself watching the charcoal burning – what was going on here? Why did I first have to light the charcoal? Why does it go from black to that orange glow to white and eventually stopping altogether? Why does it not continue burning indefinitely? What is smoke? Why did it release heat? And just exactly what is heat? The question of what happens during a braai continued to haunt me and eventually drove me towards studying chemical engineering. Having studied and worked as a chemical engineer for some years now, few things give me the same pleasure as being at a braai and being able to partially and vaguely explain the chemistry of a braai. Needless to say I don’t get invited to a lot of braais – covalent bonds, radiation, heat transfer, activation energy, electron delocalization are not popular topics around a braai. The first step in the braaing process is getting together some charcoal and some blitz, I’m assuming the meat is already there. Commercial briquette charcoal is a combination of carbon, limestone and binders which hold the charcoal together. The carbon molecules form long chains held together by covalent bonds. An atom consist of protons which have a positive charge located at the (nucleus) centre, and neutrons which are neutral particles that prevent protons in the centre from repelling each other and flying off. Then there are electrons, negatively charged particles which behave more like waves moving around the nucleus. In fact is was trying to understand the atomic structure, particularly electron behaviour, which played a pivotal part in the development of quantum mechanics. The goal of each atom in life is to be a noble atom. Noble atoms are fulfilled in that they have a full number of electrons in each of their orbitals – Helium, Neon and Argon are noble atoms and rarely react with other atoms. All other atoms are not fulfilled, and we must be thankful because it is their lack of fulfilment that makes life interesting. So they steal and share electrons. Take salt, it looks innocent enough but if you look closely you find a great inequality going on. It is made of Sodium and Chlorine (NaCl), it is an ionic bond because Chlorine which is much greedier for electrons has stolen an electron from Sodium. The extra electron that Chlorine has makes it feel like Argon, the extra electron Sodium lost makes it feel like Neon. So everyone is happy. The vast majority of atoms don’t like this inequality so they prefer sharing electrons –which is what we call covalent bonds. Water which is hydrogen and oxygen forms covalent bonds. The electrons belong to everyone (no doubt a socialist system) and everyone is happy because they now feel like the nobles. Oxygen feels like Neon, and Hydrogen feels like Helium. One of the things we know about relationships between people is that the more they share with their possession with one another the stronger the bond between them. It is no different in the chemical world the more electron pairs that atoms share the stronger the bond between them. Some molecules share few electrons, others share more. A chemical reaction is the breaking of particular bonds between atoms to form different bonds. Breaking bonds requires energy, forming bonds releases energy. The breaking process requires energy because atoms are reluctant to break their bonds, they need an incentive which we call the activation energy. It is the minimum energy required to break a covalent bond. Which is why in order to start a braai, you need to kickstart it by increasing its temperature to a point where the covalent bonds break. Once the bonds are broken the atoms will want to find more stable atoms, and once they do – fireworks! When atoms come together to share electrons and form covalent bonds they release energy. If the energy released is greater than the energy you put in we get an exothermic reaction. Combustion reactions are always exothermic reactions. Carbon- carbon (C-C) bonds, and carbon-hydrogen (C-H) bonds are not as strong as carbon oxygen (C-O) bonds or hydrogen – oxygen (H-O) bonds. When charcoal burns; the carbon-carbon bonds are broken and carbon dioxide and some carbon monoxide are formed. I might be exaggerating but I am convinced that this chemical reaction (the breaking of C-C bonds and C-H bonds) is probably the most important and far-reaching reaction there is. It is the same basic reaction used to power our cars and our bodies. Energy in our bodies is produced by breaking carbohydrates, protein, fats which are all chains of hydrocarbon molecules! Back to the braai! Now your charcoal is burning and has a lovely orange glow to it, you put on your meat and it makes that characteristic swooshing type of sound that is always the highlight of any braai. Now the question which any lover of a braai must ask themselves at some point in their lives is how exactly does heat get from the charcoal to the meat? What exactly is heat? To put it vaguely heat is a form of kinetic or motion energy and occurs when there is a temperature difference between two objects. There are three different ways to transfer heat between objects: conduction, convection and radiation. An analogy I use to conceptualise the abstract nature of heat transfer is loading and unloading of bricks from a bakkie. There are 3 basic ways of unloading bricks that are on a bakkie and getting them to the building site. Firstly, you can get a couple of guys get them to stand in a line and the first guy closest to the bricks takes one and passes it on, the next guy does the same and eventually it gets to the site. That’s conduction: the energy packet (bricks) moves from one molecule to the next adjacent molecule in a series until it reaches the destination. The second way to unload the bakkie is to get a lot of workers to come individually and to each take a brick from the bakkie and go take it themselves to the site. So you are not passing the bricks in a line, but rather each person comes and fetches a brick and takes it to the site. This is called convection; it’s how you cool your soup when you blow air over it. The third way to unload the bakkie is to get one guy to stand on the bakkie and to throw all the bricks from the bakkie to the site, this way you don’t need any workers at all. This is radiation; heat transfer through a vacuum because it does not need atoms to transfer its energy. And that is how your juicy steak is getting cooked by infrared radiation. I think the word radiation probably has a negative perception. This is associated with nuclear waste and radioactive decay which are gamma rays; high energy radiation due to its high frequency and short wavelength. However electromagnetic radiation is quite a ubiquitous phenomena of nature. Even our bodies give off infrared radiation. Infrared radiation has a much lower frequency and longer wavelength. Radiation is also responsible for the visible orange glow of the charcoal. Light, infrared, microwaves, radio waves, ultraviolet , x-rays are all different forms of electromagnetic radiation/ waves. The difference is in the frequency and wavelength of each type, so really we cannot escape electromagnetic radiation. 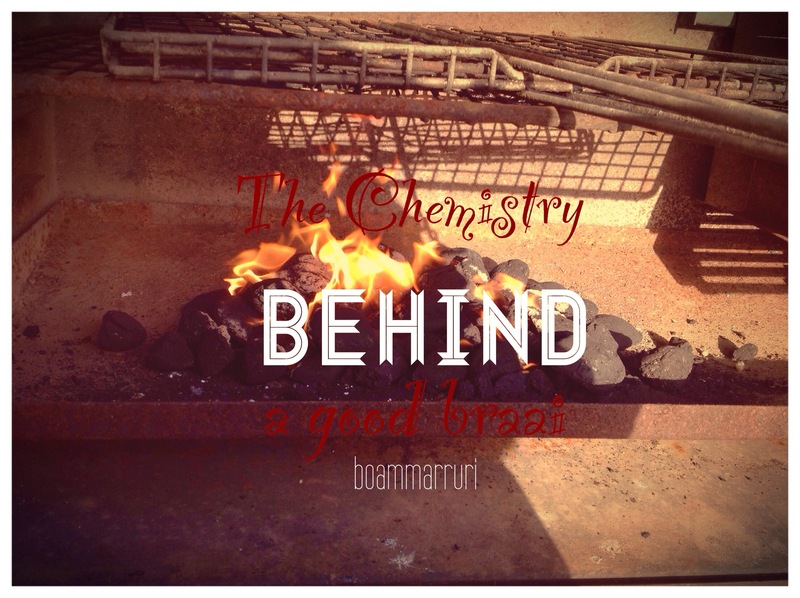 That in a nutshell is a small glimpse of the chemistry behind a braai. So remember we kickstart the charcoal by igniting it to give it activation energy to break existing carbon bonds. Once the bonds are broken the atoms will go find more stable and stronger bonds which will then release heat when they form. When a covalent bond forms, an electron in an excited state moves to a lower energy state and gives off energy in the form of electromagnetic waves, which we feel as “heat” and see as light. The heat released then sustains itself supplying the necessary energy to continuously break carbon bonds. We call these bonds covalent bonds, where electron pairs are shared between atoms. Carbon reacts with oxygen and produces carbon dioxide. The energy released consists of light and infrared radiation. A kilogram of charcoal releases about 32 mega joules of energy – that’s enough energy to “boil” 100L of water, and by boil I mean raising the temperature of water from 25°C to boiling point (100°C). Once most of the carbon bonds have been broken the reaction comes to a whimpering end and by then your braai should be well done. Next time you are at a braai, enjoying the tantalizing taste of a perfectly cooked steak just think of all the magic of chemistry that has went into it – I know I will! Next Next post: I don’t need God to be good?